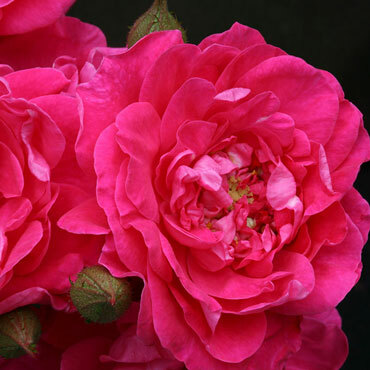 This tough-as-nails shrub rose was developed in Canada, where it was bred specifically to survive even the harshest winters of Zone 3 without protection. This means that you can enjoy its vivid fuchsia, double blooms all season long, even through the winter! It will bring a much-needed pop of electric magenta color to desolate winter landscapes, and will be the life of the party in the middle of summer. Its clusters of 2.5-3" double flower heads sit atop a backdrop of glossy, dark green foliage, and give of a delightful, mild apple-scented fragrance. Party Hardy prefers well-drained, fertile soil in full sun or partial shade. Zones 3-9. U.S. Patent No. 21,449. Sun/Shade: Full to partial sun. Color: Deep pink with a lighter pink reverse. Foliage: Glossy medium green foliage. Depth: 12-18 inches. Plant so the roots are below soil line. Pruning: Prune in early spring when half of the growth buds swell. Remove dead or damaged canes. Cut back 1/3 to 1/2 of previous years growth. Remove any crossing canes and suckers. Flowers: Old fashioned, very double and rounded with medium-large, about 3-4 inches in diameter, in clusters. Over 40 petals.